A collection of what EvenVision is Reading. Our team at EvenVision is constantly reading articles on design, development, and strategy from sources throughout the web. We not only love to read and learn but love to share and empower those around us. Therefore we've decided to start compiling a list of all the valuable and actionable articles we've been reading. Elements in a layout need to be allowed room to breathe, which can be accomplished by including white space in the design. By including white space in the positioning of major elements, we can create visual hierarchy, contrast, and feelings of order. Tweaking the amount of space between the smallest elements in the design, such as letters and words, can help these elements become more noticeable, and the overall design look more organized and harmonious. White space also provides an aesthetic to the layout that communicates quality, such as we see in luxury shopping centers versus retail stores. Although some may view white space as being useful only for more content, it is essential for making a website engaging and easy to read/navigate. Over the years, button styles have gone through a vast array of changes. They started out as 3D buttons, which made them obviously interactive. Buttons then morphed into being skeuomorphic – they looked like real-world objects, such as calculator buttons. From there, buttons evolved into what we are used to today – flat and almost-flat. These are harder to distinguish from content, so it is common to use colors, shadows, and layers to set them apart from the rest of the page. It can be tricky to guide users to use buttons correctly, so here are a few tips on designing user-friendly buttons. Make them look like buttons: Square or circular, rounded or rectangular. Make it easy for users to interact: Big enough to click, enough padding that users don’t miss-click. Label buttons with what they do: Add a clear message of what happens after clicking. Use color contrast to guide users to action: Colors draw attention, signify types of actions. Maintain Consistency: The user should be able to recognize buttons on every page. 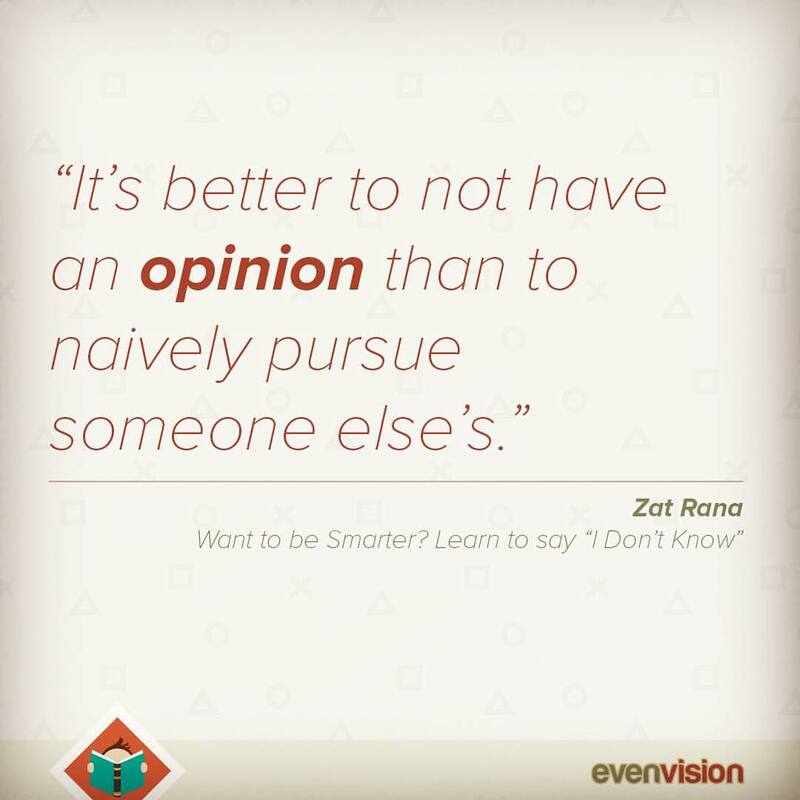 Witty and observant, these are exactly the things we train ourselves not to do. Sometimes the best thing for us is to look at the culture and go the opposite direction. What's the point of looking like you're doing a good job if you're not actually doing a good job? We should all strive to be the engineer in the room. New to UX Design? Feeling Overwhelmed? New designers face an ever-changing field that requires constant learning, which can quickly become overwhelming. In order to prevent new designers from becoming overwhelmed and burnt out, this article suggests using a method called “Chunking”. Chunking is grouping together the areas you want to focus on into well-sized pieces that you can then begin working through. Doing this will help new designers be able to learn and keep up with the field of design. Start capturing what you want to do – Note down all of the ideas in your head. Find the commonalities – Group your ideas into chunks, based on their commonalities. Get the chunks done – Find a technique that works for you, such as the “Most important tasks first” technique. Create a habit – Make a habit of getting through manageable chunks daily. This article compiles an excellent, simple list of do’s and don’ts in web design. It explains why you should/should not do each in an easy-to-understand way, and includes real-world examples of what works and doesn’t work in web design. Provide a similar experience, regardless of the device. Make it easy to scan your pages. Ensure that clickable elements look like ones. Make your visitors wait for content to load. Sacrifice usability for the sake of beauty. Lottie is an incredible software development that translates After Effects animations into code for application on apps and digital tools. It's incredibly simple premise is as earth shattering as its adoption rate by top firms in the industry. It's only been live for 6 months as of this writing but already people have figured out incredible ways to take simple video clips and make complicated strings that simulated UI design interfaces with beautiful animations. This is a fascinating little article talking specifically about why people a drawn or attracted to wide objects. Specifically, the article speaks to the automotive industry and psychological study of human decisions and dominance. Studies by the University of Kansas found "that wide products exude strength and dominance if they have a discernible 'face'". In applications other than strictly cars, considering the design of objects width is an important variable to account for. If you're attempting to create a positive, inviting, children's rooms then careful consideration to products that mimic wide faces should be considered. At first glance, it's often hard to see the application of tutorials like these. On its own it's impractical, but it's a small tool in an ever-developing toolkit, and can be applied in interesting scenarios. All of artificial intelligence breaks down into little pieces like these, and together they create a force that's revolutionizing our world. A level-headed sketch of the coming changes caused by artificial intelligence, including who will be most/least affected, what to focus on to keep your own job, and what we as technologists need to think about when we create new tools. This is a fantastic little insight into one of the biggest no-hire tells in the design industry. When you're looking at someone's portfolio and they comment that the final product looked nothing like they envisioned it's an attempt to distance themselves from responsibility. The problem is that if a design was executed poorly when taken to develop it's a reflection on the designer more so than the developer. Especially if the designer decided to feature this work in their portfolio - their best of the best. At EvenVision is take an approach that distances ourselves from our competition. All of our designers need to not only be versed in design terminology and core basic fundamentals but also need to know the code their designs require for execution. Sure, it takes a lot longer to properly train an individual, but we end up with Designers that can design great digital products and developers who can easily execute and form beautiful products. Designers need to accept responsibility for their work. From start to finish. A designer is the maker, the crafter, and the guide. This is a great introduction to the term "Affordance." 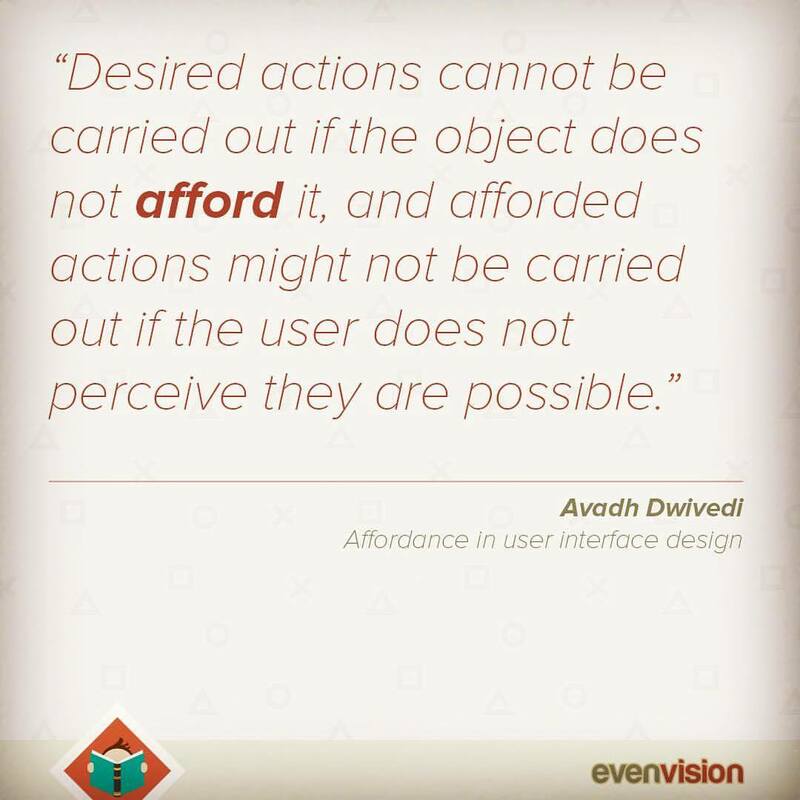 In brief, an affordance is described as "all actions that are made physically possible by the properties of an object or an environment. The term came to prominence with American psychologist James J. Gibson, in his book "The Ecological Approach to Visual Perception." It was subsequently added to by Don Normal when he introduced the idea of "perceived affordance" in his book the "Psychology of Everyday Things." That said, affordances is an important aspect of User Interface design and important consideration for us at EvenVision. It's the idea that objects can provide possibilities, and if designed properly, guide people along intuitive paths to achieve goals and desired actions. A button is a button is a button up until the time it's not. It's important that we design affordances that are not only perceptually accurate but also objectively sufficient for all users. This is a powerful principle. Especially as a designer going into client meetings with people who are as unique as their businesses. There are tons of situations, markets, and industries where we don't know everything, but because we have such a broad general knowledge from all these unique meetings it's easy to pretend like we do. And dangerous. If we make wrong assumptions we can seriously affect the outcome of a project, and the health of a business. Fortunately, we always ask questions. We learn to follow up "I don't know" with "What do you think? ", and "Why does this project/industry/business work the way it does?" And that's how we learn. The article outlines basic principles for measuring the maturity of a company's relationship with design. The basic pillars of a design team's state (system, process, vision) serve as guides for how well a team is doing internally, and where they most need to grow. It'll be really interesting to see how our design team measures up by this standard, and what insights are gathered from the exercise. 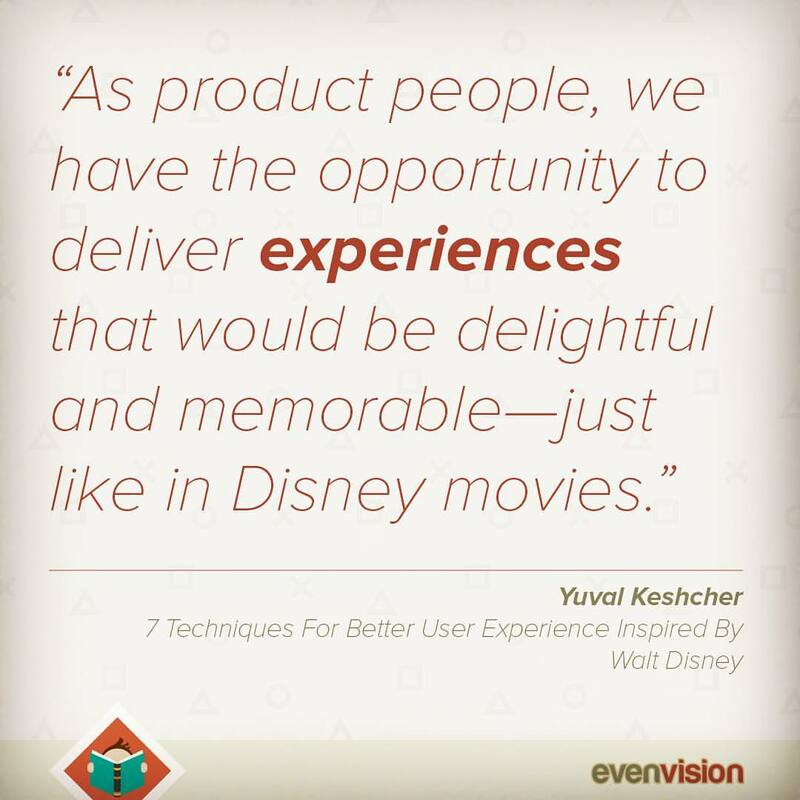 This article outlines some of the best techniques pioneered by none other than the ultimate founder of user experience - Walt Disney. One thing that Disney did so beautifully was tell a story and leave people with a positive experience. In user experience design the ultimate goal is to provide an experience that successfully provides a user with accomplishment, ability, and simplicity. Give them an experience worth remembering, through a tale worth telling. Personal takeaway (not sure if it's the right subject matter for the blog post): Secular take on a profound biblical principle. Being able to take criticism, feedback, and advice you don't necessarily want to hear is a huge life skill and keeps you from becoming stagnant. That's not to say that every piece of advice is something you should follow, but you shouldn't ignore ideas just because you weren't ready for them. Business-y takeaway: You never know what's going to shift your perspective, or where the shift could come from. It's important to be willing to hear advice & take in ideas, otherwise, you're limiting yourself to what you're already comfortable with, stunting growth. Fantastic article that reviews Product Design, and the concepts accompanying the field. It’s as much a resource for design, marketing, and psychology as it is an attempt to compile key resources and related text that defines our current understanding of designing for user based solutions. Product Basics – Put users first and solve a need. Psychology & Social Psychology – Products persuade, trigger motivate and provide ability. Product Management – Measure to manage and improve. Design – Do not re-invent the wheel but design to solve problems. Brand Strategy – Understand and control the promise and then exceed it to delight. 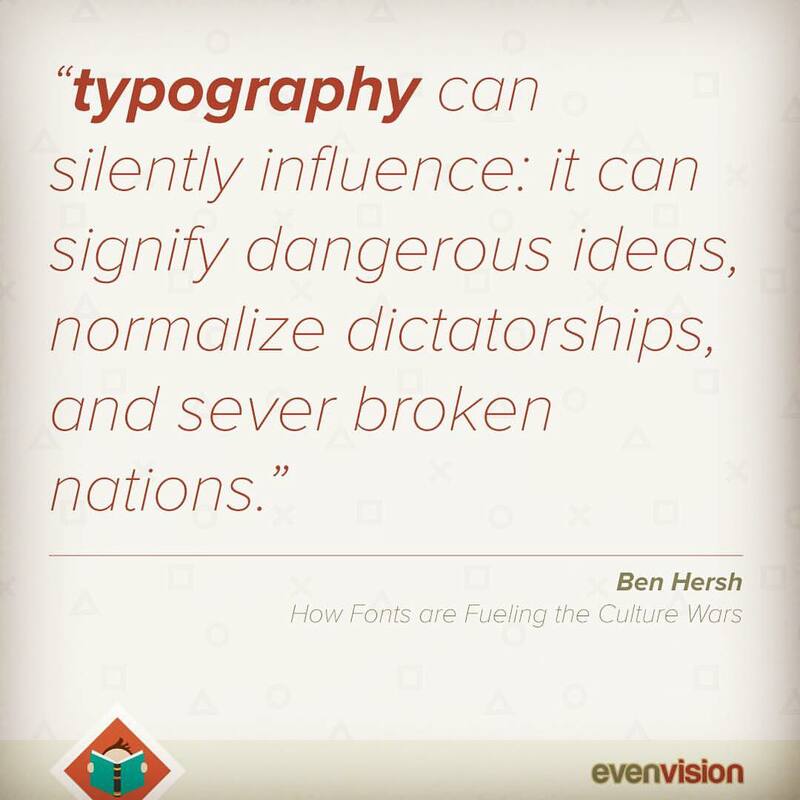 Great article that talks about the power of typography. It reviews typography and a historically powerful tool that defines ideologies silently speaking louder than the words. The author does a beautiful job of explaining the cultural implications of typography and the value of properly executed construction. It’s as much a review of current times as it is a reflection on to past ideals told simply through a font. Beautifully well done. The unfortunate reality of life is that even the best ideas if poorly communicated sound terrible. 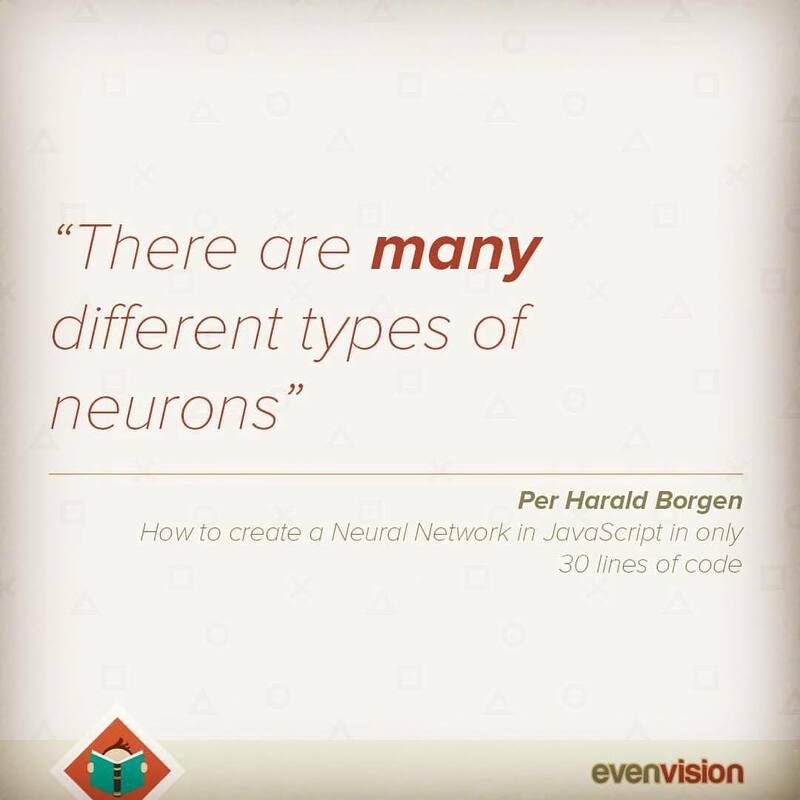 This article does a great job address the true unicorn skill within design and that is simply the ability to write. It’s important to note though that those that can’t read wont be able to write. Reading is the core premise of how we ultimately write. Read to learn to write. Write to design. Write to solve. Write to imagine. This is a great little read that touches on the core premise of design. Design for humans. It talks at length about getting away from the desk and getting to be around the people that you’re actually designing for. It’s a lecture about the value of continual feedback but stresses that there is a need to ask the “right” questions and speaks to framing and problem-solving. But perhaps most importantly it addresses the concept of minimum viable product which is part of the world thanks to Eric Reis and his book The Lean Startup. 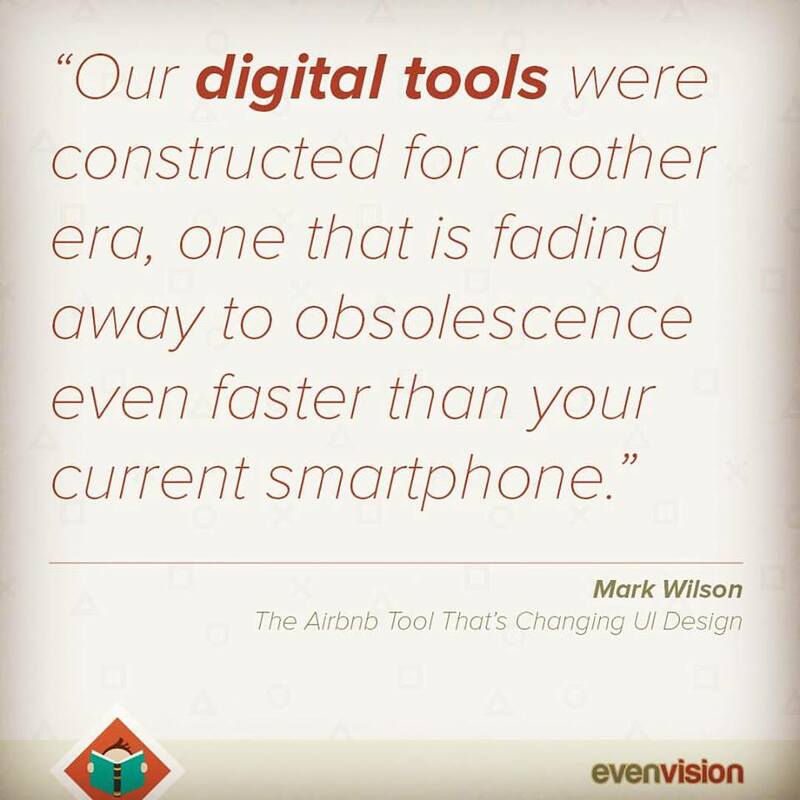 It’s about agility, iteration, and the build-to-learn process. Highly recommend reading. 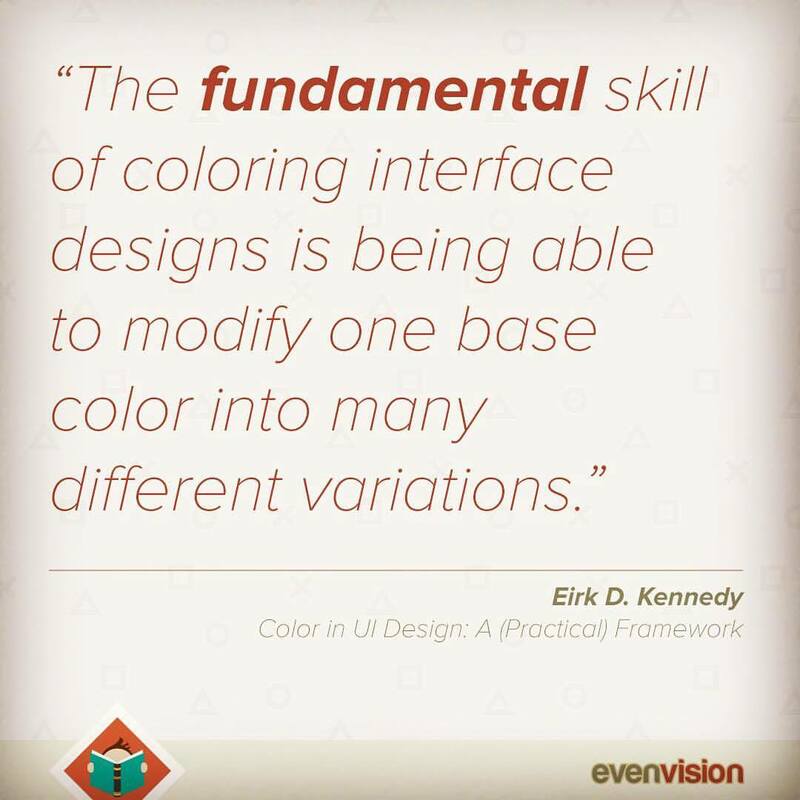 This author has crafted a fantastic piece that covers one of the most fundamental skills in UI Design, or really Graphic Design in general: the selection of color and it's variations. Often times we are limited to 1 color and are forced to make variations off of the color to accommodate interactive elements. Here the author has broken down some key concepts with regards to selection based on real world examples of shadow and light. Writing is a skill that most of us take for granted. If you stop and think about the power we all have the ability to express ideas, tell stories, and communicate to other individuals complex or simple emotions it's truly one of the greatest assets we have. It's great then to see Design Thinking and Design Strategies become a valuable component of the writing experience. This author has done a great job summing up observations into Design and picked out key skills that Designers use daily which could benefit writers. However, we could probably argue that Design merely borrowed from writing, so it's more like a post-modern reflection than anything groundbreaking. The study of color psychology in branding is fascinating, but can often be misleading and full of generalizations. One beautiful aspect of this simple infographic by Towergate Insurance is that it attempts to move beyond basic sweeping commentary and attempts to contextualize the study of color to specific industries. By doing so this infographic does a great job of presenting information that is actually actionable. That said, we at EvenVision will retain a healthy skepticism regarding color connotations and choose instead to approach color based on individual projects and individual needs. This is a fantastic little article written by a Product Designer at Facebook and his experience with his first project. It was a simple task and one that he thought he had nailed, but it ultimately turned out he had missed some key aspects of working on a team and working as a designer which rendered his work a complete waste. When working with a team it's crucially important to look back to look ahead. Design is about solving issues, but you need to know what they were, and what to look for in solving them. This article is full of excellent questions to consider when bringing onboard new members of any team. Becoming a leader isn't about waiting for a promotion. In the world of design, it's about initiative, humility, and craving to be better and do better. This article does a great job summing up the attitude required to push a company, to push the people around you and to grow and blossom through the trails and tribulations of life. These are skills that are developed over time as much as they are attitude based character qualities. Critique is an important aspect of design, development, and growth in general. Critique provides an opportunity to constructively build, test and adjust. It's often an element feared or something that people are weary of, but in truth, it should be something embraced, regularly practices and structured. This article does a fantastic job breaking down some key aspects of the critique experience that Facebook employees to move mountains. You can learn from everyone, but it's ideal to learn by those that have experienced and produced the best of the best that can be. This is an article written by just that very person, and it's incredible how humbling her writing is. She speaks to lessons learned, of pride and it's negative impact on design, and to the reality of mindset. It's not a self-up, but an article written by a designer as a memoir of growth, the pains, and the positives. Design is a service if you make it one, but it takes time and dedication to hone it as a skill. What looks like genius is actually the result of brute force. Developing your eye is the single most important skill to hone. To do things of great impact, you cannot be a lone wolf. You cannot evaluate a design without knowing its intention. If you don't want design to be treated as a service, you need to have an opinion about what problems are worth solving and way. Investing in your communication skills gives you a 2x multiplier on your effectiveness. Everyone feels like an imposter sometimes. This article is written from the perspective of an experienced designer with the desire to help students new to the field learn great visual design. The author does an excellent job of breaking it down into a couple of simple-to-follow steps that anyone can implement. Her main point is that learning great visual design involves intentional time, practice and observation. Be intentional in observing the world around you - the physical world, apps, and websites. Form opinions on what you like and don’t like in what you see. Ask yourself why the designs you observe work or don’t work. Although you won’t become a great visual designer overnight, if you take what you’ve observed, put it into practice, and think critically about what you have now designed, you will be well along the way. In many ways, content strategy is an old field, but in a like fashion it's had a renaissance of sorts and is starting to receive some much-needed limelight. 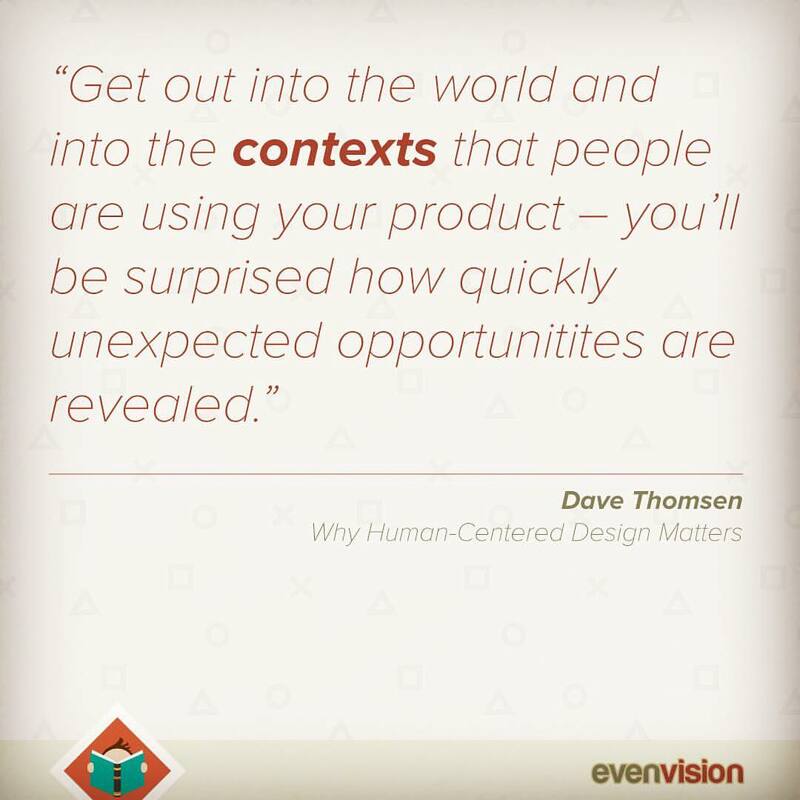 More importantly, it's starting to be seen as a key component in designing a great product. Content strategy is finally receiving a place at the table beside Communication, and Product Design; as it focuses primarily on the type of communication and can help guide product design along a path towards success. Content strategy can be summed up as the responsibility for creating experiences that are clear, consistent and most importantly - compassionate. Now you may find it weird that EvenVision is featuring an Article based on how to interview for Internships, but if anything it's a perfect article for those looking to join our team, or those trying to understand who we are and what we are seeking to accomplish. Visual Design - Is the work aesthetically pleasing, polished, complete and whole? 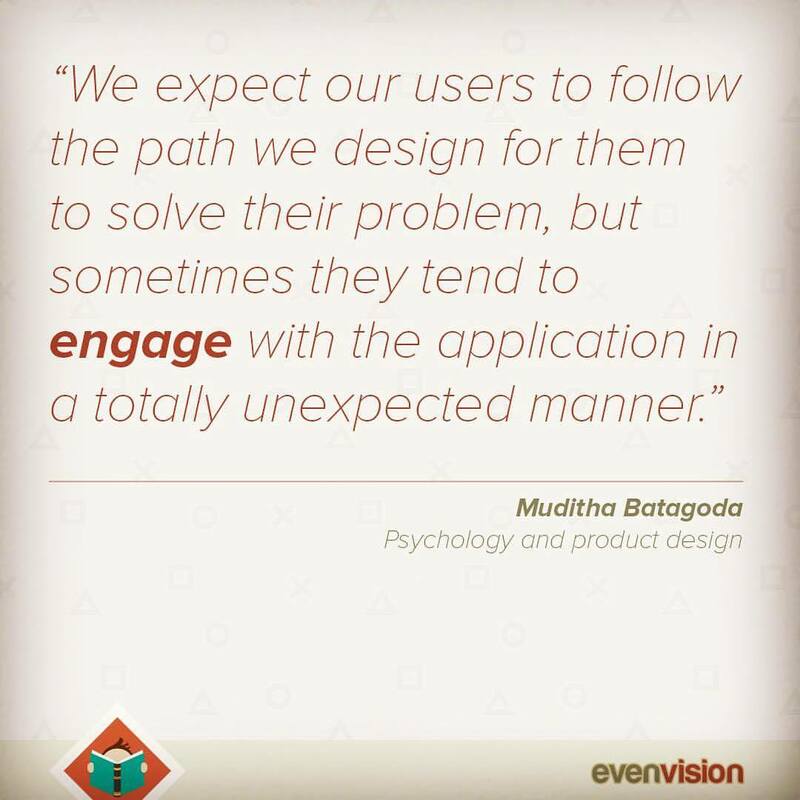 Interaction Design - is there intuitive user flowers from end-to-end? How does someone get from point A to point B? Product Thinking - what is the problem that we are trying to solve? This article does a great job not only addressing topics for interviewing for an internship, but also for interviewing clients. Do not get caught in the weed. Do not assume. Ask questions. Understand what you're trying to solve and trying to accomplish and then start high and work yourself down to specifics. It doesn't matter so much the aesthetics of the website prior to completion, but that the systems built resolve issues and provide services. To say the least, while at first, this may seem like an odd article to feature here, it's, without a doubt, a brilliant addition to our list. Remember: We're always posting articles we read first on Facebook and Twitter. Let us know, we're always happy to chat and help out!